Apr - 17 | By: Todd E. Freeman | no comments. Oregonians! Enter to win a full size Cell Count poster from The Dude Designs. 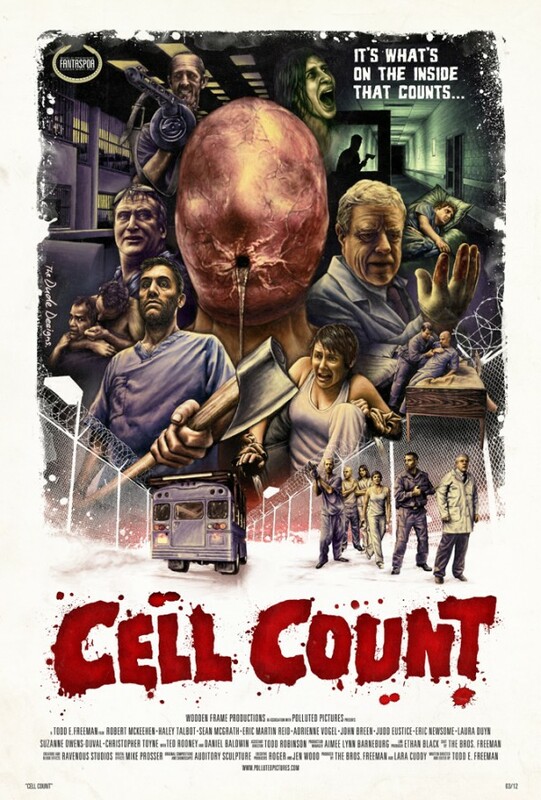 As a thank you to the state we love and the people we love making movies with we are giving away 10 full size 27×40 posters for our feature film Cell Count. Click HERE to enter the Contest on Facebook! PORTLAND, Oregon (April 17, 2012) – The Fantaspoa Film Festival announced last month that the feature film “Cell Count,” Produced by Polluted Pictures in association with Wooden Frame Productions, would be the Closing Night Film at their Festival in May. Last year’s Closing Night Film, “Stakeland”, was later released in theaters in 2011 by IFC Films and Dark Sky Films. This is the Fantaspoa Film Festival’s 8th year. It is the first genre festival in Brazil as well as the biggest fantastic film festival in Latin America. “We are so excited to have our World Premiere at the Fantaspoa Film Festival. We’ll be among some of the very best that Fantastic Cinema has to offer from around the world,” said Todd E. Freeman. “Our intent from day one was always to make a film for enthusiasts of the Sci-Fi and Horror genre. It’s going to be a blast to see it in a theater full of genre fans for the first time… as well as subtitled in Portuguese!” This year’s festival is also recognizing the work of two horror icons Stuart Gordon (Re-Animator) and David Schmoeller (Puppet Master). Both will be present at the festival doing Q&A’s after their classic film screenings. The production company of the film Wooden Frame Productions is currently in talks with Sales Representatives as well as Distributors all over the world. The poster from the film Cell Count designed by Tom Hodge, The Dude Designs, debuted on Ain’t It Cool News website in March as well. Go to www.pollutedpictures.com to see the Official Trailer!